Which Planet Has More Rings: Jupiter or Saturn? Scientists still have a lot to learn about the vast, fascinating, mysterious zone around Earth they refer to as space. Space research discovers new facts about the cosmos all the time. One thing they do know is that there are eight primary planets in our solar system: Earth, Saturn, Jupiter, Uranus, Neptune, Mercury, Venus and Mars. (Pluto was demoted to a dwarf planet.) From Earth, you can see any of the other seven planets through a telescope. Four of these planets are known to have rings, but not all of the rings are made equally – Saturn stands out for having the largest and most impressive set. Which Planet Has the Largest Set of Rings? While all the so-called "giant" planets in our solar system – Saturn, Jupiter, Uranus and Neptune – have rings, none of them are as spectacular as Saturn's. Neptune has six known rings, and Uranus has 13 known rings. While scientists don't know for sure how many rings Saturn has, they believe it's in the region of 500 to 1,000. By contrast, only four rings have been identified around Jupiter. Mercury, Venus and Mars have no rings. Jupiter is named after the Roman god of the sky and thunder and is the fifth planet from the Sun. It is made of gas and covered in swirling clouds of ammonia and water. Although it doesn't have a solid surface, it may have a solid inner core about as big as Earth. Jupiter is famous for its Great Red Spot, a giant storm bigger than Earth that has endured for hundreds of years. One day on Jupiter takes only about 10 hours, meaning it has the shortest day in the entire solar system. It takes Jupiter about 12 Earth years to make a complete orbit around the Sun. Jupiter has a tilted equator but only by 3 degrees, meaning it spins almost upright. This also means it doesn't have the extreme seasons other planets endure. Scientists have observed four rings around Jupiter. They are made of small bits of dust, which makes them very faint and difficult to see unless they are backlit by the Sun. In fact, they were first discovered only fairly recently, by the Voyager I spacecraft in 1979. The rings formed when meteors hit the surface of Jupiter's small inner moons, kicking up dust then began to orbit around the planet. Jupiter's rings are called the halo ring, the main ring, the Amalthea gossamer ring and the Thebe gossamer ring. The halo ring is the innermost ring. It is about 20,000 km thick and looks a little like clouds. Next to it is the main ring, which is about 7,000 km wide and surrounds the orbits of two small moons, Adrastea and Metis. On the outer edge of the main ring is the Amalthea gossamer ring, which extends out over the orbit of the moon Amalthea. Scientists think this ring is made up of miniscule dust particles that are about the size of cigarette smoke particles. Finally, the Thebe gossamer ring, the faintest of the rings, extends from the orbit of the moon Thebe. The edges of the two gossamer rings overlap the main ring, making them difficult to define. Like Jupiter, Saturn is a massive ball consisting mostly of hydrogen and helium. The second largest planet in the solar system and the sixth planet from the Sun, it's surrounded by more than 60 known moons. Saturn is named after the Roman god of agriculture and wealth. One day on Saturn takes only 10.7 hours, meaning it has the second-shortest day in the solar system (a close second to Jupiter). Saturn makes a complete orbit around the Sun in about 29.4 Earth years. Because its axis tilts by 26.73 degrees – similar to Earth's 23.5-degree tilt – it experiences seasons. Unlike Jupiter's rings, Saturn's rings were first discovered a long time ago, by Italian astronomer and physicist Galileo Galilei's telescope in 1610. Thanks to modern robotic spacecraft like Pioneer 11 and Cassini making trips to Saturn, scientists now know quite a lot about Saturn's rings. Each one is about 400,000 km wide (the same distance as that between Earth and the moon). However, they are only about 100 meters thick. They are made up of countless particles, believed to be icy snowballs or ice-covered rocks. Some are the size of a mountain; others are smaller than a grain of sand. Saturn has many, many more rings than the other planets – up to 1,000 – with gaps in them. Nobody knows for sure how old Saturn's rings are. 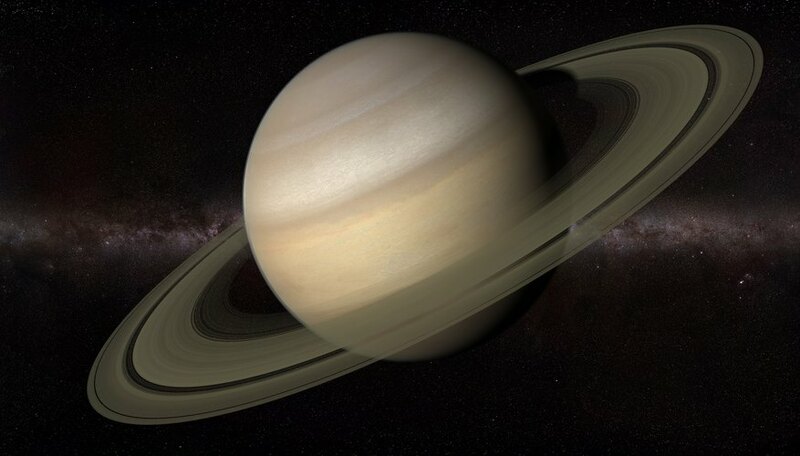 Some scientists believe they are as old as Saturn itself, which formed about 4.6 billion years ago. However, Cassini's voyage to Saturn in 2017, which attempted to weigh the rings to establish their age, suggested that they may be only about 100 million years old – which is relatively young in solar system terms. The solar system is home to hundreds of moons in our solar system, with new moons being confirmed all the time. Provisional moons are given a letter and a year, and as soon as they are confirmed following further observation they get a proper name, typically after a mythological character, approved by the International Astronomical Union. An exception to this is Uranus, whose moons are named after characters in William Shakespeare's plays, such as Ophelia and Puck. Moons, which are also known as natural satellites, come in all shapes and sizes. Most of them are solid, and some have atmospheres, a layer or a set of layers of gases held in place by the moon's gravity. It's believed that most moons were created from discs of dust and gas moving around planets in the early solar system. Earth has one moon, which scientists think was formed when when a large body about the size of Mars collided with Earth, ejecting a lot of material from Earth into orbit. Mars has two moons, and neither Mercury nor Venus have any moons at all. Jupiter has 79 confirmed moons – four large moons and many smaller moons. Because it has so many moons, scientists sometimes say it has its own kind of miniature solar system. Jupiter's four largest moons are Io, Ganymede, Europa and Callisto. They were first discovered by Galileo Galilei in 1610, which resulted in their collective name as the Galilean satellites. They were all named after characters in Greek mythology who were connected to Zeus, the king of the gods. Io, which was named after a nymph who had an affair with Zeus, has the most active volcanoes in the whole solar system. The largest moon, Ganymede, which is even bigger than the planet Mercury, was named after a young Trojan boy who was made cup-bearer to the gods by Zeus. Europa is named after another of Zeus's many lovers, who became the queen of Crete. This moon has a frozen crust, which may lie above a liquid-water ocean. Yet another nymph who had a love affair with Zeus, Callisto was later changed into a bear by the god. This moon has very few small craters, suggesting a small degree of current surface activity. Saturn doesn't have as many moons as Jupiter, but it's not far behind. So far, Saturn has 53 confirmed moons, and another nine moons are waiting to be officially confirmed. These include Phoebe with its many craters and Titan, with its misty, obscured surface. NASA Space Place: Why Does Saturn Have Rings? NASA Science: What Is a Planet? Gillespie, Claire. "Which Planet Has More Rings: Jupiter or Saturn?" Sciencing, https://sciencing.com/planet-rings-jupiter-saturn-19909.html. 16 November 2018.